LOL 🙂 brings back memories, eh? sigh… hostel life! brings back memories of our lovely “Grub”! 🙂 To think that was what i used to call food a couple of years back.. LOL! Liked the cartoon. And the “grub” seems to be some kind of fortified meal :). Renu´s latest blog post – Who’s who at work? ps – the doodle is really cute … did u do that yourself ? ?? TW´s latest blog post – Gah! The cartoon is awesome! I love the way you drew the chef scratching his head! 🙂 So much expression just within stick figures, two thumbs up! Ah – you stoked up memories – good and bad – I remember when the “mess” manager (each student volunteered to take a turn) had mostly potato dishes for a whole week. In protest, we all started singing “Yeh alu alu kya hai, yeh alu alu” (sing to the tune of “ilu, ilu” from Saudagar) every time the poor girl walked past. Somewhere in my olfactory receptors also lies a traumatized memory of the cook’s hairy armpit. Our hostel food sometimes tasted so bad even the cat refused to eat it!! Hahaa! This had me laughing crazy. I had a similar experience and the food was not good. Well, I did credit my slim build to that food, just a little more than one month out of it and I am trying so many other remedies to keep fit. Absolutely Ashwathy! Seriously, sigh… hostel life. It’s one of the reasons I didn’t get a real job and became a grad student instead 😛 Thanks for commenting! Thanks, Renu and welcome to my blog! Mentalie! Welcome to my blog! I loved your blog and I am subscribing to it! Mystery meat eh…? Heh heh! Sounds like the time when our hostel gave us chicken at half the price. On a completely unrelated note, the cat went missing. But I agree – hostel food DID indeed keep me fit. I can never get back that athletic body back… sigh. Thanks Archana, for all the wonderful compliments! 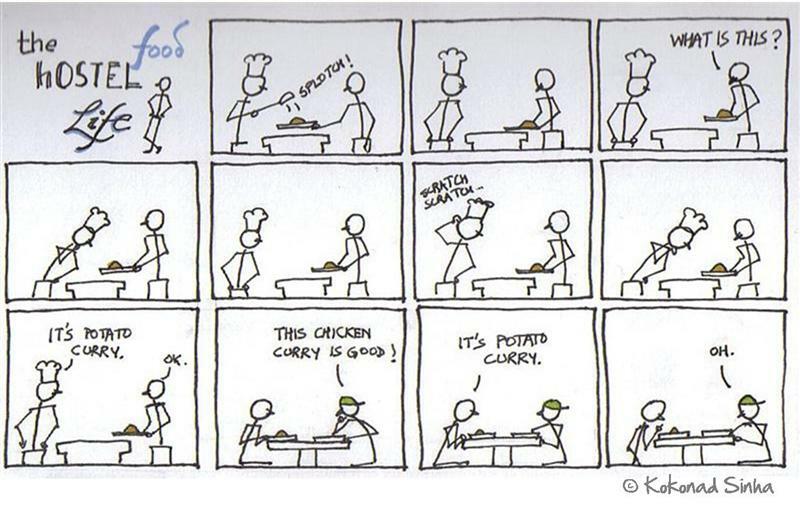 I am glad you noticed that ‘aloo in aloo parantha and a cat’ – ha ha! I chucked to myself as I wrote that yesterday! Wow, you make breakfast sound like a full fledged breakfast buffet! (I skip a lot of breakfast, but I do love breakfast food any time of the day!) Wow – people actually looked forward to eating! LOL @ Freshman 15! Thank you Rads! Grasshopper in okra? Well, in the cook’s defense, he may not have been looking when the grasshopper hopped in. 😛 But yeah, hostel food did keep me fit – along with the fact one sweats in India but not in the US. Sigh. Hi Savithaji! Are you back from Korea? Thank you ji for the compliments ji! That “alu alu kya hai” totally cracked me up! Man it’s been so long since I have heard that song! I am curious though… what is it about hostels and cats? Hi Nicky! Welcome to my blog, and thanks so much for commenting! I am glad you found it funny… 🙂 I am subscribing to your blog too! i was this confused northi in a southi college, in first I mixed the sambar n rasam to make it taste good…by the end of the term all the southies were following me lol. but i must appreciate my college for getting better caterers later. aww i miss hostel! @ Kokonad: Lol yeah the freshman 15 was definitely a part of my college – students from colleges near by used to come eat at our dining hall using our guest passes, it was that good. 😉 Haha, quite the rarity to find a college with a good dining hall though, guess it’s just my good luck that a foodie like me ended up studying there! @ Debleena: That’s funny that you mixed sambar & rasam because that’s actually something that all South Indians do anyway, heh. Tastes better together, than separate. 😛 And yes, the dining hall was the place to be on Sundays. I miss college!! Heh heh, I agree – it was either that or growling stomachs, i agree. Brinjal and groundnuts? SERIOUSLY? What on earth is it called? Why cannot I picture it in my head…? Thank you so much, Mentalie! Thanks for the link – I like gapingvoid.com too! Another doodle guy who uses the visiting cards to doodle 🙂 And thank you for blogrolling me as well! I developed a hatred towards Potato and paneer eating hostel food all these years. And absolutely cannot eat dosa anymore. Thank you Nikita! 🙂 Ha ha ha! Ek toh you said I was being insensitive when I made fun of tall people in my blog… now I wonder if this is a trap for making fun of skinny people (again). And by the way, staying in a hostel has its down sides too. You don’t get to shower that often. And monkeys steal your food. And your room grows smaller everyday. And you can’t wait to get out. 😛 But thanks for dropping by, and more thanks for commenting too! c. The most creative people never realized how amazing they really were, like you, for example. d. The above is not really an option, it’s a fact. f. I should probably stop writing options that aren’t options. So, like I was saying – have you read the 55-fiction you write? 🙂 Girl, to come up with stories that shock you consistently is an art. It’s not every one’s cup of tea. I am a BEEEEG fan of your 55 fiction. Screw inside dal? Ha ha ha! That’s pretty screwed up, like college is not enough! Welcome to my blog and thanks for commenting Uddipan, do keep visiting! and yes, i love the doodle. Hi Riya! Welcome to my blog! Thanks for commenting too! 😀 hilarious!!! but there’s this other thing too…even if ur a fab cook…cooking everyday and eating ur own food is slow poison for your taste buds. Hostel food accelerates the process! Reva´s latest post – Back to the Future! so well. And your diagrams are fantastic, ever considered getting published etc ? Blogging Badshaah! Ha ha ha! Well, thank you A! 🙂 Nyaah.. .me not publishing – most of my theme-based ideas run out of gas after a while – like for the last couple of weeks, I have been thinking of what 2D I want to make – I am drawing a blank! Talk of writer’s block! Sigh.. I really miss hostel life.. I remember – we used to stand for about half an hour in a queue for what the hostel authorities called “paper Roast Dosa”. It tasted like paper, alright.. I guess… everyone goes through the “hostel food” phase. My experience hasn’t been too bad, actually… barring a few incidents in between. btw… there is a near-deafening silence lately… on your blog…! I have lots of time these days, but you aren’t updating. Do I need to threat you ? The canteen wallahs taught you that you can’t have everything at the same time. You see, they had your best interests in mind and furthered the all round growth. By the way, chicken is our neighbour-hostel used to be quite on the lines of your desciptions and with that when a few of my friends started noticing disappearances of stray-dogs around the hostel, guys stopped eating non-veg for a month. I do agree that ‘ghar ka khaana’ gained extreme popularity on my palate chart! Man, did I miss daal-bhaat and simple bhindi curry – which I used to really dislike when I was in school! Life does have funny ways of putting things in perspective! Heh heh heh… we had that with our hostel cat! 🙂 And yeah, sure. They had our best interests in mind and furthered the “all round” (really?) growth. Haha i love the comic strip! Not a good time indeed. chitz´s latest post – A Reality Check…. Welcome to my blog, Chitz, and thank you for commenting!